If you're on the lookout for a casual yet incredibly stylish ensemble, try teaming a 3.1 Phillip Lim side seam tee with black print skinny pants. 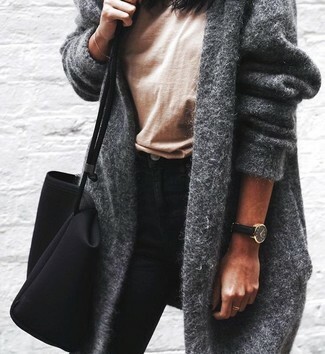 As well as very comfortable, both garments look amazing when paired together. You could perhaps get a little creative in the footwear department and dress up your ensemble with black suede ankle boots. If you're on a mission for a casual yet incredibly chic getup, consider wearing a 3.1 Phillip Lim side seam tee from shopbop.com and white shorts. These pieces are very comfortable and will look great when worn together. To add oomph to your ensemble, finish off with beige leather heeled sandals. If you're after a casual yet seriously stylish ensemble, go for a 3.1 Phillip Lim side seam tee from shopbop.com and blue flare jeans. As well as very comfy, these two items look incredible when worn together. Add a glam twist to your ensemble with beige leather pumps. 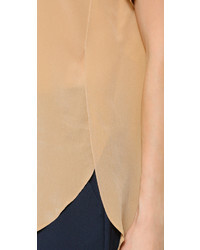 If you're on the hunt for a casual yet absolutely stylish ensemble, wear a 3.1 Phillip Lim side seam tee from shopbop.com and blue skinny jeans. As well as totally comfy, both of these garments look fabulous when paired together. Rocking a pair of mustard leather pumps is a simple way to add extra flair to your getup. 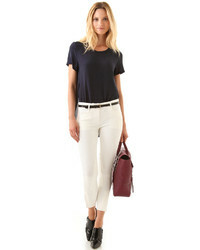 If you're in search of a casual yet totaly stylish getup, pair a 3.1 Phillip Lim side seam tee with burgundy flare pants. As well as very comfortable, both pieces look great paired together. You could perhaps get a little creative when it comes to footwear and dress up your look with black suede pumps. If you're on the lookout for a casual yet totaly chic look, choose a 3.1 Phillip Lim side seam tee and white flare pants. As well as very comfortable, both garments look great together. Choose a pair of beige leather heeled sandals to va-va-voom your outfit. If you're scouting for a casual yet totaly stylish getup, go for a tan crew-neck t-shirt and black skinny jeans. These two items are totally comfy and they also look stunning when paired together. If you're a fan of relaxed dressing when it comes to your personal style, you'll love this incredibly stylish combo of a 3.1 Phillip Lim side seam tee and black leather leggings. You could perhaps get a little creative when it comes to footwear and elevate your getup with black leather pumps. If you're hunting for a casual yet stylish look, reach for a tan crew-neck t-shirt and burgundy skinny jeans. As well as totally comfortable, these garments look great when worn together. Play down the casualness of your look with tan leather pumps.